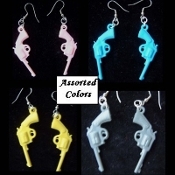 1-Pair from ASSORTED COLORS Vintage Mini GUN PISTOL CHARM EARRINGS - Funky Western Cowboy Jewelry - Miniature 60's-70's Plastic Guns Pistols Gumball Vending Charms, approx. 2-inches long. 1-Pair (*Chosen from Assorted Colors: Many NOT shown) Great for any Punk COWBOY or COWGIRL!